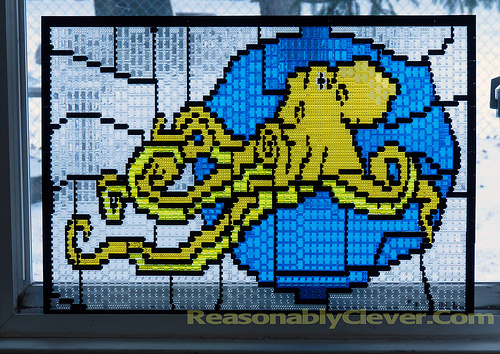 Chris Doyle‘s stained glass creation features a complex octopus design. It incorporates both transparent bricks and plates for a more detailed depiction. I’m still left to wonder why an octopus? Well, it’s not overly impressive as far as stained glass design work goes, but I suppose it is reasonably clever. I’ve been touched by his noodley appendage. I would much prefer this to the mess of working with real stained glass.